As much as Bangkok is known as a shopper’s paradise, the Siam Paragon in Bangkok is definitely the Mecca of shoppers the world over. Set quite conveniently in Bangkok’s shopping district and close by to the Siam Centre, this mall is one of Asia’s biggest. 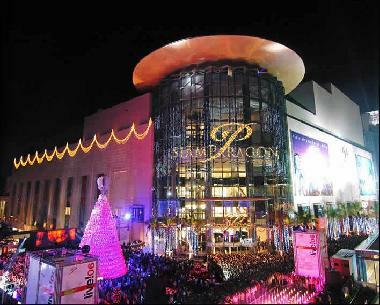 The skytrain within the vicinity takes tourists from Siam Paragon to Central World, Gaysorn and other shopping areas. The mall towers over its competition in the surrounding area and promises a shopping experience like no other. Not only is the sheer size of the place impressive, but so is the inside of the structure. It comprises a comprehensive range of branded stores, a multiplex theatre, an underwater aquarium, restaurants, a hall for opera concerts, a Thai gallery and so much more. The ground floor of the mall has a variety of gourmet food dining outlets spread across a vast hall. While the mezzanine level of the mall sells expensive perfumes and top of the line make up brands. Fast food lovers will find all their requirements at the basement level which has chains from McDonalds, KFC, Burger King and Subway. The second floor has showrooms which will attract Ferrari, Lamborghini and Maserati lovers. These showrooms are where enthusiasts could gaze at the latest cars straight from the production line. Also on this floor is Asia Books offering a large collection of books which would probably take the whole day to go through. However, this is not the only book store at Siam Paragon as Kinokuniya offers books in different langugages from Japanese, Thai, to English with smaller sections set out for French and German. Movie buffs have not been forgotten and could indulge themselves at any of 9 theatres and 5 IMAX cinemas available. Families will definitely enjoy the Siam Ocean World which showcases a variety of different marine life at Siam Paragon. As mentioned above, the mall is well connected to various transport links which could be used to get back to one’s Bangkok accommodation. Many serviced apartments in Bangkok offer facilities that are on par with hotels. Such luxury Bangkok Apartments are convenient for travellers who want accommodation for longer stay, but at a price that is more affordable.